Fortunately, none of us took the admonishments by our parents when we were young to not play with our food too seriously. 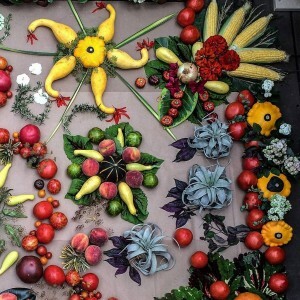 The other day we really turned our inner child loose and played with lots of veggies, fruit, flowers, and leaves to create our version of a mandala for the 4th of July holiday. 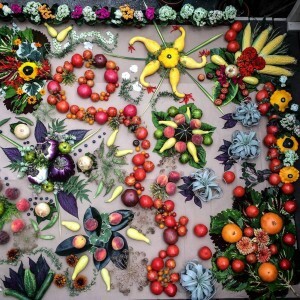 Truthfully, we hadn’t yet decided what we were going to post on Oak Street Garden Shop’s Facebook page for the 4th and when we thought of doing a big design using all our varieties of food, we knew this would be the perfect thing – our version of botanical fireworks! Thankfully the end of June is pretty hot and there isn’t a whole lot going on as far as planting, projects, or customers. This might normally be a bad thing for business, but, on this particular day, it was actually pretty good. To top it off, we’d come in that morning to a shop with no power since there’d been some pretty hefty storms the night before. 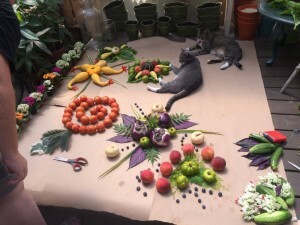 After we came up with the big botanical art idea, Molly grabbed lots of brown Kraft paper and laid it on the floor of one of the display stages, moving furniture out of the way to create a big space to work in. Jamie grabbed a ladder and set it up on one side so we’d be able to take pictures of it from above when we were finished. 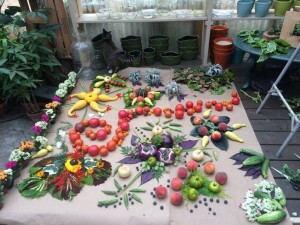 I began gathering various leaves that I thought would be fun to incorporate with the peaches, tomatoes, eggplant, squash, butterbeans, blueberries, corn, and more that we began to amass. 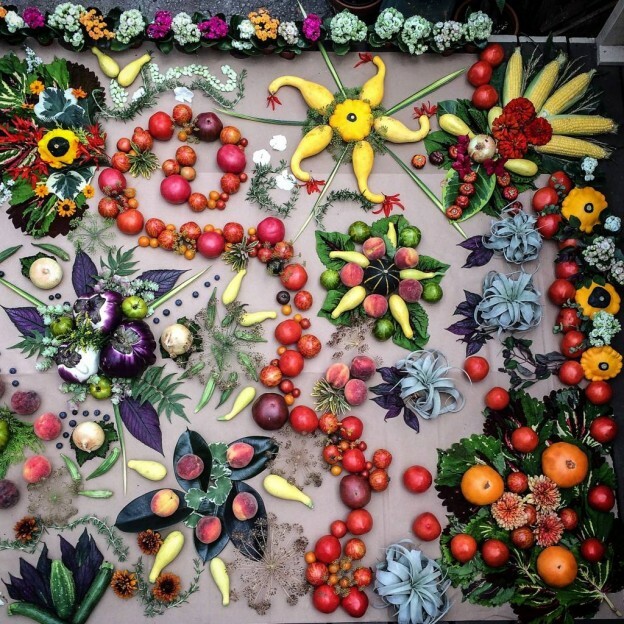 Slowly we started playing, laying out various veggies and fruits in designs that caught our fancy. Angie brought in some big Kong coleus leaves, and I went across the street to cut some dried dill flower heads to add to our mix of food, foliage and flowers. Liam came and went, but he was surprisingly calm, simply walking through on his way to lie down under the coffee table we’d moved out of the way. 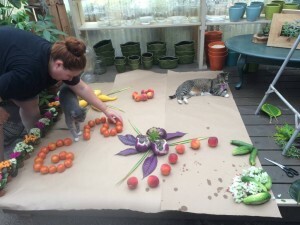 For a while at the very start, he and Tacca lounged in open spaces not yet covered with botanicals. Finally, though, they became bored and went off in pursuit of other things…or maybe to take a nap. Slowly but surely our project became a colorful tapestry of shapes, textures, and design, with items carefully placed just so and moved if we weren’t happy with how it looked from atop the ladder. While this project was taking shape, Pinkie was busy planting two of the cast stone head planters – but that’s for another post…. I love how our project turned out. 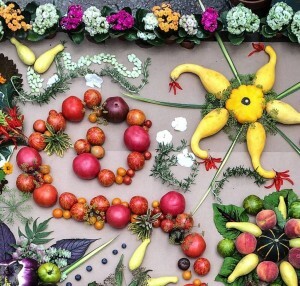 Playing with food has never been so much fun! 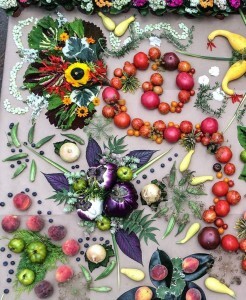 This entry was posted in Garden Art, Project, Vegetables and tagged botanical fireworks, botanical mandala, group project, vegetable design on July 5, 2015 by Kris Blevons.